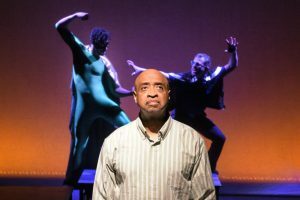 In William Bivins’ play, there’s one thing alt-right and Black Lives Matter protesters can agree on: they both hate “Scapegoat.” The Black superhero, created by aging graphic novelist Clive Booker, fights racism by absorbing racists’ negative energy. Clive’s curious critique of race relations in his floundering comic art irritates everyone, including himself. 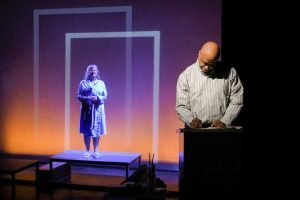 In this action-packed drama of creator and created, Bivins sketches the dangers of commenting on the rapidly evolving racial tensions of our time. Bebop and cool jazz whizz us through Director Norman Gee’s allegro production. 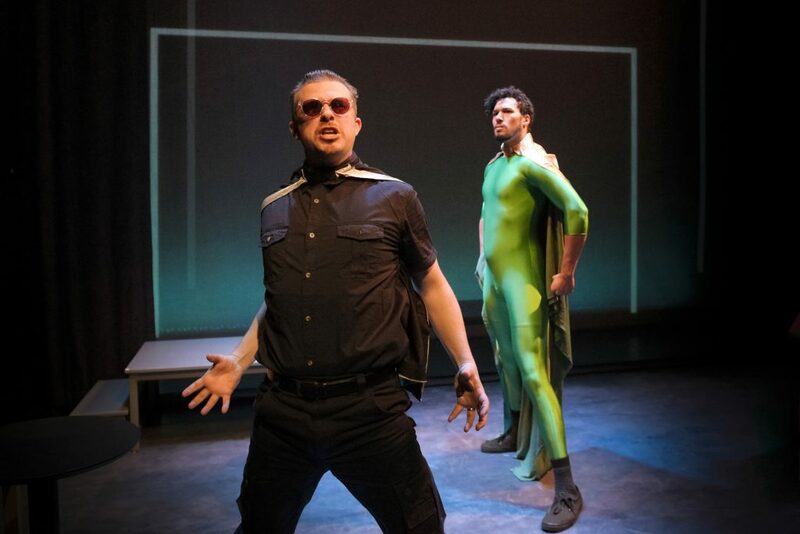 Drew Reginald Watkins and Douglas B. Giorgis zip across the set, enacting superhero and super-villain. Watkins plays Scapegoat, the hero who absorbs all negative feelings. Giorgis plays Scapegoat’s soothsaying nemesis, Noon Day Demon. Scapegoat and Noon Day Demon are enmeshed in a furious battle for Clive Booker’s life. At one point, Watkins spins off stage like a raging top. Keep your eyes peeled as these super humans race around the stage, attempting to control their cartoonist’s suicidal tendencies. We root for Clive when Noon Day Demon tempts him to commit suicide. A gun remains tucked under a stack of comics in the corner of Clive’s desk. Every time Clive attempts to drink away his depression, we nervously glance at his messy desk, awaiting the worst. Luckily, Scapegoat always rescues Clive from the Noon Day Demon. The more negative Clive’s thoughts, the stronger Scapegoat’s powers. But Scapegoat’s great strength has become Clive’s crutch. A new story is forming in Clive’s head, but he is obsessed with drawing his outdated comic. And Lexy (Cathleen Riddley), Clive’s ex-wife and best critic, thinks it’s time for Scapegoat’s heroic career to close. Clive and Lexy rekindle their love as they plot an end for Scapegoat. When the comic sells surprisingly well, ex-husband and ex-wife come closer together. We wonder if they reforge their union. Riddley and Washington’s back and forth leave us in stitches, enjoying the palpable energy of an old married couple. When Lexy’s son Dwayne is shot by a Killer Cop, we wince at the POW! action bubble that pops on the projection screen. But Scapegoat leaps into action. Staged with true comic book panels—Scapegoat, Noon Day Demon, and Killer Cop lurk behind a thin curtain, sliding in and out of their cartoon confinement. The heroes and villains gritty bodies teem with energy. 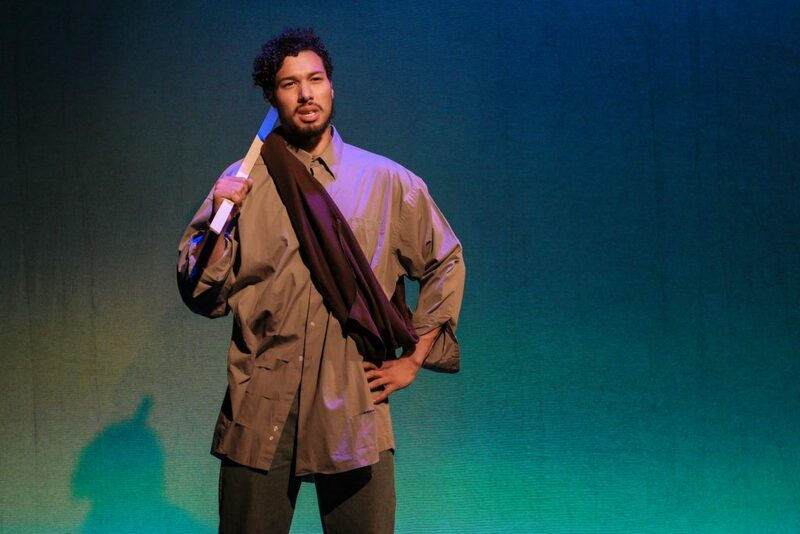 I swear, Rhonnie Washington, as Clive, plays “drunk” better than any Bay Area actor. Clive polishes off three drinks by the final curtain in this 95 minute, no intermission production. Washington’s inspired acting is authentic. He perfectly displays the fractured mind of a crazed comic artist—dealing with Dwayne’s loss and the pending cancellation of his hottest hero. Outraged protesters and suicidal thoughts close in on Clive, but the ghost of his father knows a way out of the controversy. Clive’s late father and Scapegoat team up to save Clive from himself and the mob. Can Clive discover his father’s secret before the Noon Day Demon convinces him to do the deed? Fly over to the Playground Festival and find out, before it’s too late! 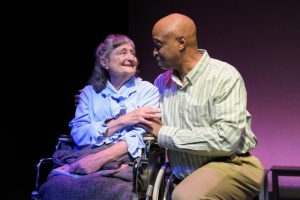 Bivins’ play pops like a gripping graphic novel, keeping us guessing, and making us wonder what will happen next. 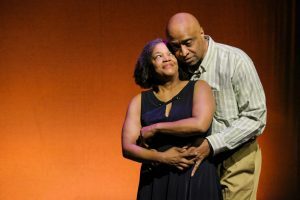 Cast: Cathleen Riddley, Patricia Silvers, Douglas B Giorgis, Drew Reginald Watkins, and Rhonnie Washington. Banner photo: Douglas B. Giorgis and Drew Reginald Watkins.